Sir Fred Hoyle was never far from controversy and is probably most widely remembered for his passionate advocacy of a ‘steady state’ universe in opposition to the ‘Big Bang’ (a term he coined). But Fred made many breakthrough contributions to astrophysics, a point often overlooked. Malcolm’s thorough review of Hoyle’s life and work began with Fred’s modest beginnings in Yorkshire when he showed few signs of his later scholarship and when his energies were mainly devoted to avoiding the education system! Malcolm traced Fred’s changing inclinations and fortunes through his time at Cambridge and early promise. 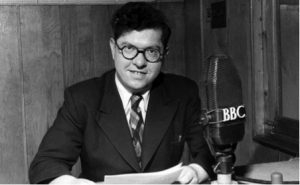 After service in World War II, Fred began a parallel career as a broadcaster making a series of pioneering radio programmes about astronomy which were hugely popular. It was in a broadcast in 1949 that he coined the name ‘Big Bang’. In 1953 it was Fred’s work on nuclear reactions in stellar cores that led him to predict an unknown resonance state in Carbon-12. At that time he was working in the US and he badgered the experimental physicists into using their particle accelerator to search for this unlikely state of the nucleus. It was found just as he predicted and Fred became instantly famous. The predicted state of Carbon-12 was vital to explaining the chain of reactions that happen in supernovae and create all the heavier elements vital for our existence. Fred said it must exist because otherwise we would not! Later in his career Sir Fred (knighted in 1972) continued to espouse the steady-state universe long after the idea had been abandoned by most physicists. With Chandra Wickramasinghe he also developed the idea of ‘panspermia’ – the movement of living organisms through interstellar space, suggesting that life did not begin on Earth but was brought here by comets and such. It’s pretty clear that Fred didn’t suffer fools gladly, a trait which made him many enemies in his own field of competence. His energies and natural curiosity also took him into other areas where his intervention wasn’t at all welcome. One such was into the possible explanation of astronomical alignments at Stonehenge which Fred believed may have been used as a ‘machine’ to predict eclipses in Neolithic times. Fred was the author of many fine books, both astronomy non-fiction and also science fiction novels. Those of us of a certain age will vividly remember the 1961 TV production of Fred’s “A for Andromeda” and drooling over a young Julie Christie. We may yet find that Fred was right with many of his other “fringe” ideas and not only the Carbon-12 state. 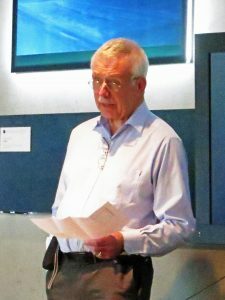 Many thanks to Malcolm for an excellent review of a rich, diverse, and outstanding career.